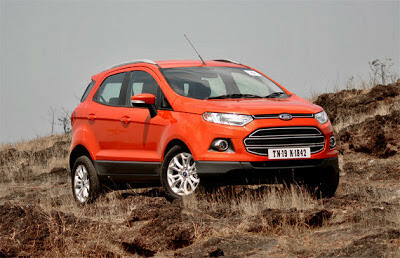 The Ford EcoSport has been an object of infatuation since it broke cover at the Delhi Auto Expo in 2012. It basked in the limelight for a year and a half for three reasons – an unconventionally attractive design, the 1-litre EcoBoost petrol engine and the sub-Rs 10 lakh price tag. In a sign that the wait is finally over, Ford has recently conducted the pre-launch test drive for media in Goa. 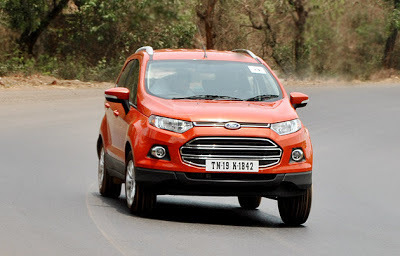 I know most of you have already seen the EcoSport in-person as part of Ford’s pre-launch campaign and formed an opinion about its design and features. But does the 1-litre EcoBoost engine pack enough punch to take this urban SUV to the top of its game? Read on to find out. In appearance, the EcoSport is unmistakably avant-garde. 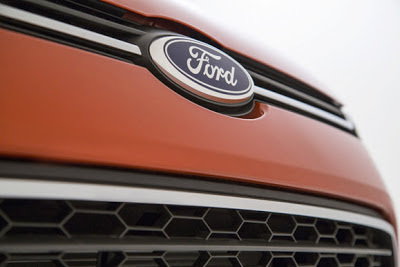 The front end features a large, ‘gaping fishmouth’ grille flanked by slim headlamps and big fog lamps, reflecting Ford’s global design language. Two bold lines on the bonnet flow onto the roof, highlighting the car’s aerodynamic prowess. I particularly liked the muscular fenders, tailgate-mounted spare tyre and the sleek roof-rails that enhance the vehicle’s SUV stance. The tailgate handle is beautifully integrated within the tail lamp and that’s a nice touch. The only thing missing is a pair of sidesteps that could greatly accentuate the SUV’s ruggedness. 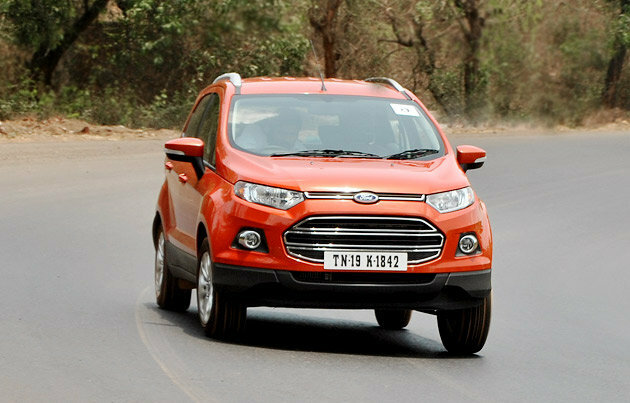 Overall, the EcoSport has a quirky design -- love it or hate it, the car certainly makes a statement on the road. Step inside and you’ll discover a welcoming combination of contemporary design and intuitive technology. Dials and knobs are ergonomically appointed and the Ice Blue dashboard illumination looks cool, too. However, I was less enthused about the hard-plastic dashboard and door panels. Frankly, the EcoSport doesn’t look as big in flesh as it does in pictures. It can comfortably seat five but going by the SUV standards, the fifth person wouldn’t be really happy. 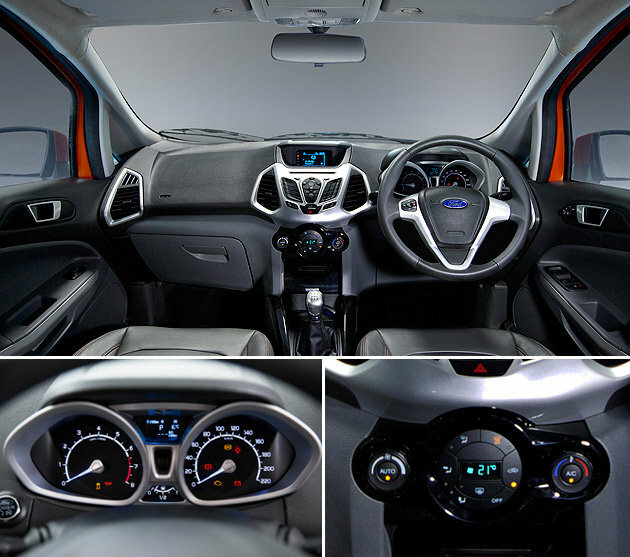 However, those upgrading from a hatchback would find ample head, shoulder and leg room in the EcoSport. The boot that Ford claims could accommodate even a washing machine is expandable up to 705 litres, with the rear seats tumbled. The driver seat offers a commanding position and excellent outward visibility. Ford seems to have employed a wide range of sound-deadening features in the EcoSport - there’s very little noise intruding on your comfort. The EcoSport is the first vehicle in its segment in India to feature Ford SYNC® connectivity platform, which provides customers with the convenience and flexibility to control their media players and mobile phones with voice commands. SYNC takes safety to new heights with a life-saving feature called Emergency Assistance. When an airbag is inflated or the fuel pump is shut off following an accident, SYNC sends a voice message to 108 (emergency phone number) from the paired mobile phone. SYNC also sends the GPS co-ordinates of the accident location and lets the occupants speak to the emergency operator -- how clever is that! 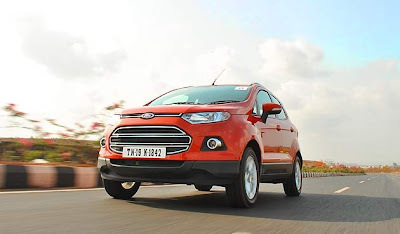 The EcoSport’s strongest selling point is certainly the 1-litre EcoBoost engine. It is hard to imagine a 999cc three cylinder engine under the hood of an SUV, but guess what; this engine delivers the power and performance of a naturally aspirated 1.6-litre engine. Helped by a turbocharger, direct injection and variable valve timing, the EcoBoost motor develops 123 bhp of power at 6000 rpm and 170 Nm of torque from 1,400 to 4,500 rpm. Dip the clutch and press the start button, the engine fires up smoothly and idles without clatter. It has enough low-end grunt to nip in and out of traffic but once you floor the pedal, there’s detectable turbo lag. However, once past 1800rpm mark, the engine revs happily and displays good power delivery. On the flipside, it becomes very audible at higher rpms. 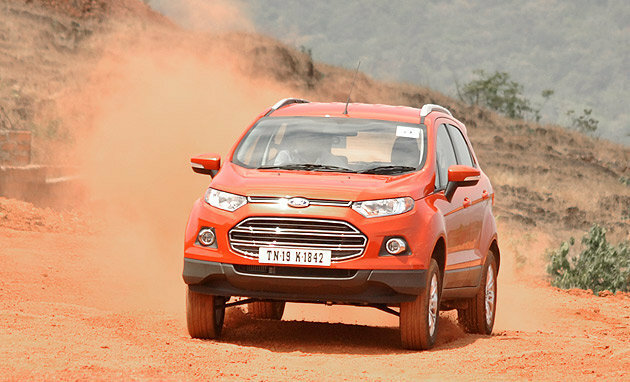 Overall, the 1-litre EcoSport is more of a practical cruiser than a fun-to-drive car. The engine is mated to a five-speed manual gearbox that offers slick gearshifts. Two other engine options will be available, too - a 110bhp 1.5 petrol and a 90bhp 1.5 diesel. 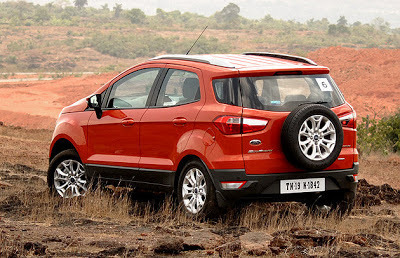 The diesel EcoSport will have more takers and I’m sure, be more fun-to-drive. Fords are generally regarded as great handlers and the EcoSport is no exception. Dampers and springs achieve an optimal balance between handling and ride comfort. The car stays absolutely pinned to the tarmac even at a close corner. I didn't think twice about rolling over big potholes or pesky curbs, thanks to the all-absorbing suspension and the 200mm ground clearance. The light steering is a blessing in city, yet precise enough at high speeds and around tight corners. Ford's Electric Power Assist Steering (EPAS) system is equipped with ‘Pull Drift Compensation’, which automatically makes imperceptible steering corrections when it notices a pull caused by wind, potholes or even differences in tyre pressure. Ford has quoted an ARAI certified mileage of 18.7 kmpl for the 1 litre EcoBoost variant. However, I rarely saw a double digit figure on the real-time fuel consumption monitor; blame it on the performance tests and aggressive driving. Otherwise, the engine is definitely capable of returning an average of 13-14 kmpl in normal conditions. The 1.5-litre petrol and diesel variants return 15.8kmpl and 22.7 kmpl respectively (ARAI figures). If I were to sum up the EcoSport in one word, it would be: intriguing. It has got all right ingredients to stay true to what Ford calls it – the urban SUV. Although the long wait of almost 17 months has led to an inevitable loss of interest, I’d dare to say that the EcoSport is indeed worth the wait. If Ford manages to price this sub-four metre SUV very wisely, it could be the beginning a new revolution in the Indian automobile market.